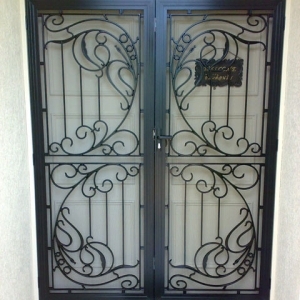 Decorative Safety Screen Panels to suit safety doors. All door inserts are gravity die cast in 100% recyclable aluminium for durability and strength. Frames are constructed from extruded aluminium. Powder coated to suit your personal style & individuality. Can be used for hinged and sliding doors. © 2011 Australian Security & Awning Products. All rights reserved.